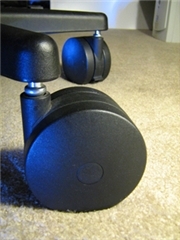 Also known as "Miracle Casters", these chair casters ease rolling on soft flooring and deep pile carpet to ease back strain in the office. Also ideal for industrial environments where workers must roll while seated on soft anti-fatigue floor mats. These Jumbo Miracle Casters are nearly 4 inches in diameter, twice the diameter of the conventional chair casters. Because of their large size and hard tread, Jumbo Miracle Casters roll easily over thick carpet, eliminating the need for a chair mat. Imagine the huge wheels on tractors and other heavy equipment. Miracle Casters work on the same principle. The bigger the wheel, the easier it will roll on a soft or uneven surface. Extra-large 100 mm (3.94") wheel-diameter rolls easily on soft flooring. Strong 220 lb. load capacity per caster, which means that a set of five supports a static load of 1100 pounds. However, for best results, we do not recommend Jumbo Miracle Casters for individuals over 500 pounds. Hard tread is designed to roll easily on carpeted and padded floors. The tread is non-marking and non-abrasive, however we do not recommend this caster for use on hardwood or tile floors. Note: Installed height is 4-7/8". In most cases, this will raise the height of your chair. When used on carpet, each Miracle Caster is guaranteed against failure for 10 years. Miracle Casters fit many office chairs.